Dr.T.Thimmaiah Institute of Technology, Oorgaum has advertised in THE HINDU newspaper for recruitment of Professor / Associate Professor jobs vacancies. Interested and eligible job aspirants are requested to apply within 08 days from 08th August 2018. Check out further more details below. 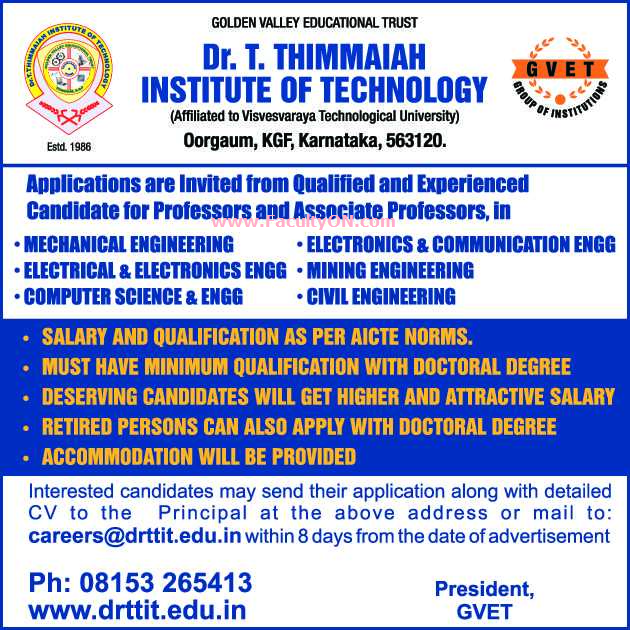 About College : Dr. T. Thimmaiah Institute of Technology (Formerly Known as Golden Valley Institute of Technology - GVIT) was started in the year 1986 at Kolar Gold Fields by Dr. T. Thimmaiah, Ph. D., (London), IAS (Retired), as the founder President under the aegis of Golden Valley Educational Trust, with the sole purpose of imparting quality technical education. Dr. T. Thimmaiah Institute of Technology is affiliated to Visvesvaraya Technological University (VTU), in Karnataka and is approved by the All India Council for Technical Education (AICTE) and at present offers Degree Courses in Engineering as given below. How to Apply: Interested and eligible candidates are requested to send their CV along with all copies of certificates / testimonials and recent PP size photos to the email address or postal address provided here.